There is no way this movie can be bad. I've loved Helen Mirren since I saw her as Morgana LeFay in Excalibur when I was way too young to be watching such things. I love director Lasse Hallström (My Life As A Dog is one of my all-time favorites.) I love Indian and French cuisine. I love comedies about cantankerous people and crossing racial boundaries. Mmm. 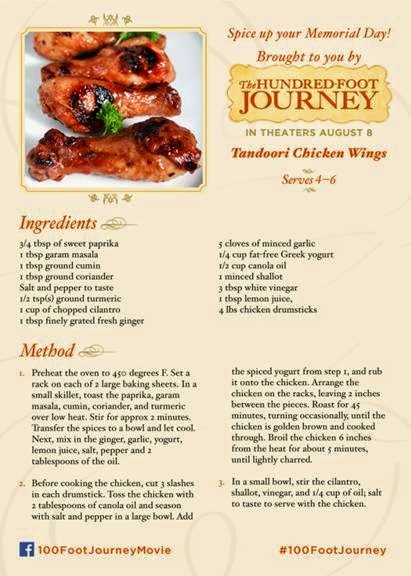 If you're planning a cookout this holiday weekend, try substituting this Tandoori chicken recipe for your usual wings. Spice things up a little with the unexpected! The Hundred-Foot Journey will be released in theaters on August 8, 2014.